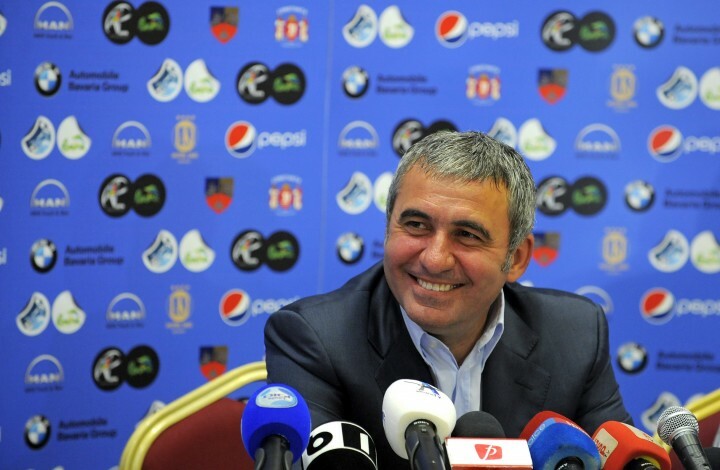 Hagi’s club, Viitorul Constanta, promoted to Liga I! Hagi’s “talent factory” just got a new quality certificate. It all started three years ago, when the legendary Gheorghe Hagi started to develop his football academy, just outside Constanta. Three years and around 10 million Euros later, the results are outstanding and show that a serious approach to youth development will pay dividends. The Academy has now almost 30 players getting regular call-ups to Romania’s youth national teams (Alexandru Buzbuchi, George Serban, Adrian Putanu, Bogdan Tiru, Gabriel Iancu and Cristian Gavra – all recently involved in the Elite Round played by the U19 in Serbia, against the hosts, Germany and Hungary) and today another important event took place. Viitorul Constanta, the platform offered to the growing talents of the Academy to prove themselves among the seniors, won 2-0 against Sageata Stejaru (goals by the young internationals Putanu and Iancu) in the last round of the Liga 2 season and earned a second consecutive promotion. The blue and white outfit will be playing first division football next season and it’s another fantastic achievement for Hagi’s club. A mad title race came to an end on Friday evening, when CFR Cluj had to replay the game versus Universitatea. With Steaua and FC Vaslui hoping to get this one wrong and leave it all for the final round, CFR felt that everything will fall apart as the home team managed to get a two goal advantage, before things turned – once again – in their favor. Some will say it’s no coincidence that a referee’s call made it possible, with Adrian Cristea booked for a second time and sent off after a too aggressive way of protecting the ball, but let’s make it clear: in Liga I, nobody should point the finger and accuse an opponent of trying to influence the outcome of a game in their favor. They are all trying in some way and at their level of influence, pushing the referees, asking and looking for all sorts of favors, trying to get the other team’s footballers to either play with less determination or ready to die on the pitch. So, especially those from Steaua, Vaslui, Dinamo and even Rapid who are now accusing CFR of getting their dirty hands on the third title in the club’s history should keep quiet and accept they’ve lost a battle in which they used pretty much the same weapons. I’m not saying it’s nice or good for Romanian football and I’m hoping to see the day when at least some of the guys involved in what happens behind the scenes will pay. It won’t come soon, not with Mircea Sandu running the Federation and Dumitru Dragomir pulling the strings in the so-called Professional Football League – read the article written by the excellent Jonathan Wilson for The Guardian -, but as we say over here hope dies last. Steaua wins against Dinamo. Great result for the fans, but will it matter in the title race? Bulgarian centre-back Valentin Iliev, who is running out of contract with Steaua and has been linked with a return to CSKA Sofia in the summer, is the hero of this much anticipated derby, which filled the stands of the impressive National Arena. The 31 years old scored a brace that was enough to seal the win, after Rusescu’s penalty had cancelled the opening goal scored by Alexandru Curtean, after a nice move by Marius Alexe. With Vlad Chiriches again impressive at the back and Cristi Tanase posing a threat with his runs, Steaua ended the game with 22 shots and had almost twice as many clear cut chances to score. Dinamo paid in the end for a very poor game from central defender Dragos Grigore, while upfront Marius Niculae looked to be struggling physically and lost his breath, feet and ideas on several occasions, and Dario Bonetti, the coach, didn’t miss another chance to have a shot at his players after the match, an approach that won’t help him stay too long at the red and white outfit. 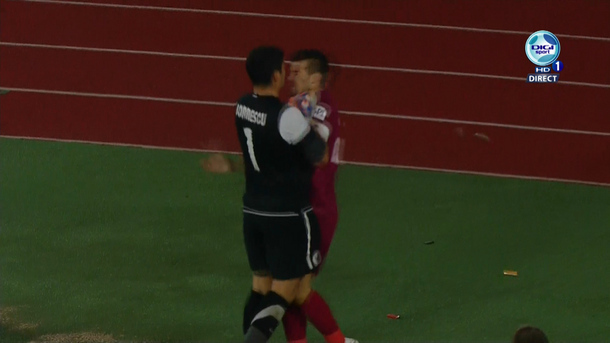 Derby of Cluj ends in violence after 30 minutes! Bornescu’s crazy act will do CFR a great favor and will add to a rivalry that didn’t need another sparkle. Not to mention the controversy added to another title that is now only three steps away from Arpad Paszkany’s club. The club that runs on the Local Council’s money and under the direct command of the village’s mayor Mircea Minea made the right call last December, when Laurentiu Dinita was replaced by Laurentiu Reghecampf, who came along with his wife, Anamaria Prodan, who works as a FIFA agent. The squad suffered massive changes, with 13 players released and 15 brought to try and help the club avoid relegation, 7 of them coming from the second division outfit FC Snagov – one of the clubs Reghecampf had worked for as a coach in the past. Among them was a certain Idan Baruch, a goalkeeper that offered a terrible and very dubious display versus FC Vaslui, in the second official game of the year, a match that made everyone think that Concordia’s players will only try to make some money before they leave the top flight. 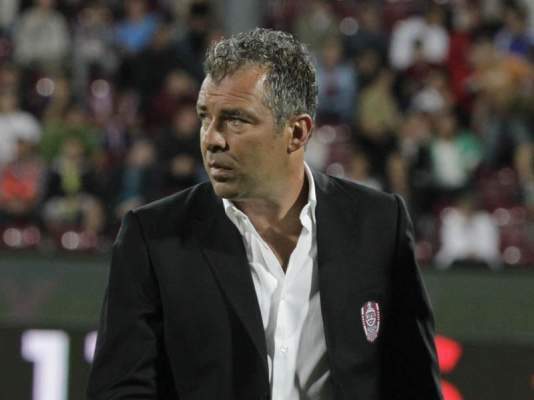 Laurentiu Reghecampf and his wife, Anamaria Prodan, have quickly rebuilt a doomed squad. 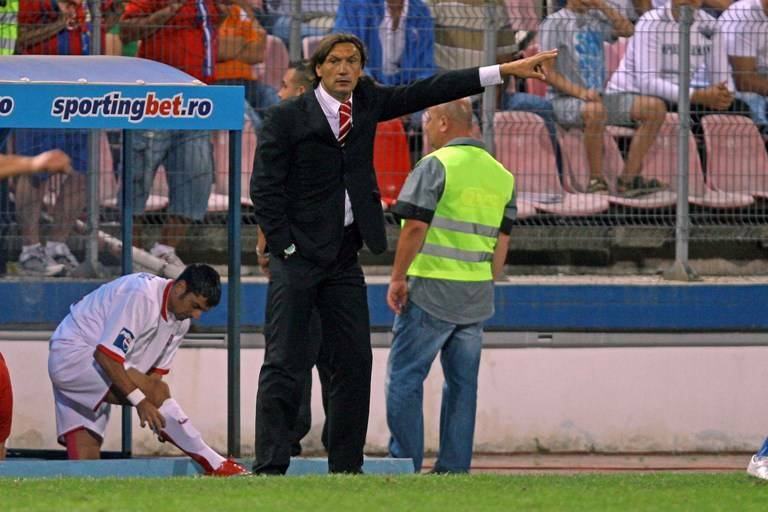 With a career that saw him leave Steaua after three years and move to Germany, where he played for Energie Cottbus, Alemannia Aachen and FC Kaiserslautern, Reghecampf had two spells as a coach with both FC Snagov and Universitatea Craiova (which he helped once avoid relegation) and a short one with Gloria Bistrita, but for some reason he always failed to stay put in one place, in spite of some promising results. He’s now linked with Steaua Bucharest, but it would be a mistake to pay too much attention to Gigi Becali’s daily TV appearances, although the 37 years old is definitely aiming higher and, if he ends this season above the line, it would be a small miracle that could get him either a good move in the near future or at least buy him a lot more time at his next club. Adi Rocha comes after a long spell on the sidelines, which ruined his adventure at Energie Cottbus. Who are the new stars? With eight goals between them, Brazilian forwards Alex (21 years old) and Adi Rocha (26 years old) have impressed in their first matches in Liga I, adding pace and the skill that’s still missing among the rest of the team lead by Vlad Munteanu, a wide midfielder (now 31 years old), who spent the past six seasons in the Bundesliga (with a short spell to Auxerre, in 2008), playing for the likes of Energie Cottbus (just like his coach), Wolfsburg, Arminia Bielefeld and FSV Frankfurt. The team’s captain is Iulian Mamele, a 27 years old central defender playing his first season in the top flight, but one of the nicest surprises comes from 24 years old right winger Adrian Popa, who under Reghecampf scored 2 goals and offered 4 assists, drawing quickly the interest of title-chasing clubs like FC Vaslui. CFR Cluj tops the league in Romania, but sacks Jorge Costa! Jorge Costa had been in charge since May 2011. CFR’s first defeat in 2012 proved fatal for the former FC Porto defender, who was heading for a first title, but won’t be there to enjoy a win that’s still likely, as the club holds a five point advantage at the top of the standings. Defeated 0-5 at home versus Rapid, Jorge Costa has been released a day later and on Sunday evening, the name of his replacement was already known: Ioan Andone.